Here is the essential manual for the AD&D game Dungeon Master. All the information you need to create and run thrilling, swords-and-sorcery adventures is clearly laid out in the Dungeon Master Guide. Learn all there is to know about magical spells, hundreds of magical devices and treasures, battles, travel, experience awards, and more. This fresh, new format is your guidebook to the challenging world of the AD&D Dungeon Master. Dungeon Master's Guide (1989), by David "Zeb" Cook with Steve Winter and Jon Pickens after Gary Gygax, is the second core rulebook for the AD&D 2e game. It was published in May 1989. About the Title. Like the new Player's Handbook (1989) before it, the new Dungeon Master's Guide reclaimed its apostrophe. The punctuation has been a part of D&D titles ever since … except that the Dungeon Master's Guide temporarily became the Dungeon Master Guide in 1995, losing both its apostrophe and its "s"!. 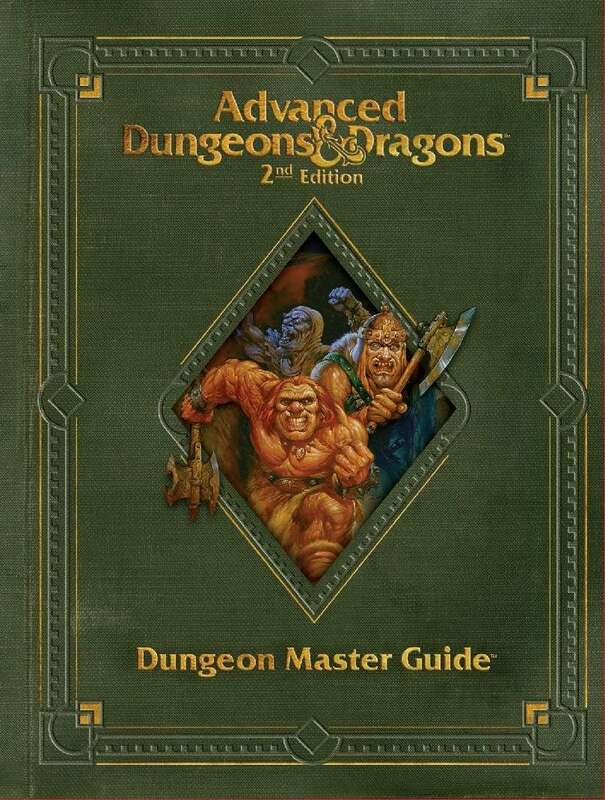 It appears that the name of the Dungeon Master's Guide almost changed with the new release too. An article that Steve Winter wrote for Dragon magazine suggests that at one time this book was called the "Dungeon Master's Handbook", which would have created a parallel between the two core rulebook names. However, it was once more a Guide by the time it was published. Many Printings. The new Dungeon Master's Guide following the exact same pattern of production as the new Player's Handbook: it saw more than 10 printings over its first several years, then was revised as part of AD&D 2.5e (1995), and more recently was published yet again by Wizards of the Coast (2013) in a premium edition. A Different Sort of Dungeon Master's Guide. The original Dungeon Masters Guide (1979) was the core rulebook for AD&D first edition. But now, the Player's Handbook had become the core rulebook for the second edition game. So, for the first time ever, TSR had to ask itself: what should really go in a book for the Dungeon Master? Like the first edition Dungeon Masters Guide, this new book's structure parallels the organization of its Player's Handbook: character abilities are followed by races, then classes, then alignment, just like in the Player's Handbook. However, one of Steve Winter's major goals for the 2e releases was that there be no repeat of material between the books. Thus the Dungeon Master's Guide instead acts as a commentary and addendum to the Player's Handbook. It's filled with basic GMing advice and additional background on the various topics; it also contains yet more optional rules, including rules for creating new races and classes. These toolkit rules aren't the sort of thing found in more recent Dungeon Master's Guides, but they show off one of Zeb Cook's major goals for 2e: that the new rules be guidelines that players could adjust for themselves. Magic items are the one truly core mechanic found in the Dungeon Master's Guide — a division that D&D has maintained through every edition of D&D except 4e (2008). Artifacts can also be found, though with the lowest count ever. The scant three artifacts of 2e can be considered a list of D&D's most interesting: the Hand of Vecna, the Rod of Seven Parts, and (somewhat more mysteriously) Heward's Mystical Organ. Second edition would correct its artifact deficiency several years later with the Book of Artifacts (1993), also by Cook. What a Difference an Edition Makes. Most of the rules changes for AD&D 2e had already appeared in the Player's Handbook, but there was one surprising take back: assassins reappear, not as a character class, but as a "reprehensible mind-set". Though assassins are usually included in lists of the bowdlerized elements in AD&D 2e, their slight inclusion here supports Cook's later statement that he removed them only because they were bad for party unity. Many Appendices. The original Dungeon Masters Guide was filled with well-loved appendices, including many wacky encounter tables and the famous list of inspirational reading. Steve Winter's article about second edition AD&D in Dragon #126 (October 1987) confirmed that there would be an appendix of "useful tables", but it turns out to be all treasures and magic items. It was perhaps an understandable change. The many and varied appendices of the first Dungeon Masters Guide were a product of its chaotic creation as a stream-of-consciousness compendium. The second Guide was a wholly different thing, created in a different era of publication. Expanding the Outer Planes. Though demons and devils were left on the cutting room floor of AD&D 2e due to fear of "angry mothers", TSR hadn't yet cut up the Outer Planes as well. A short discussion of them references their classic names — including the Nine Hells, the Seven Heavens, and the Twin Paradises. These planes would be rebooted in Planescape (1994), then their new names would be tipped into the 2.5e version of the Dungeon Master's Guide (1995). About the Creators. Cook was the designer for the AD&D 2e project, working alongside editor Steve Winter, who set many of the original organizational goals. Looking at the preview, the PDF seems to be missing art - there are just blank boxes. It's this the same in the full PDF? I 100% agree with these others. Would buy POD in hardcover, but I won't in softcover. These are not meant to be softcover books. If these three core books were hardcover I'd buy all three in a heartbeat. Won't purchase softcovers though. Are we likely to get a POD of these at any point? I see requests for it here. I too missed the release a few years back and would love to get them. Please POD! I still have a few of my 2e books, but I'd love to print out the parts I've missed, or which are starting to fall apart from use. I'd like to jump on the bandwagon for POD releases. I missed the reprinting back a couple of years ago and this would be a great way to make up for that. Agreed! Please bring this to POD!... 2e is the best version of the game. Core rule books are getting harder to find. POD versions of the core rule books for 1e, 3e, and 4e, but not 2e?... We need POD's of these core books! Cheers!